Thank you to the author for providing me a review copy via Netgalley in exchange for an honest review! This did not affect my opinion in any way. I’m not usually a fan of historical fiction. It bores me, it’s written dryly, and I just don’t connect as much to the characters. But The Weight of Our Sky is different. It’s captivating, in a devastatingly emotional way, and its stunning writing pulls you in. You feel for the characters and people in this book, so much that it hurt. Somehow in less than 300 pages, this book breaks your heart and mends it back together, over and over and over again. 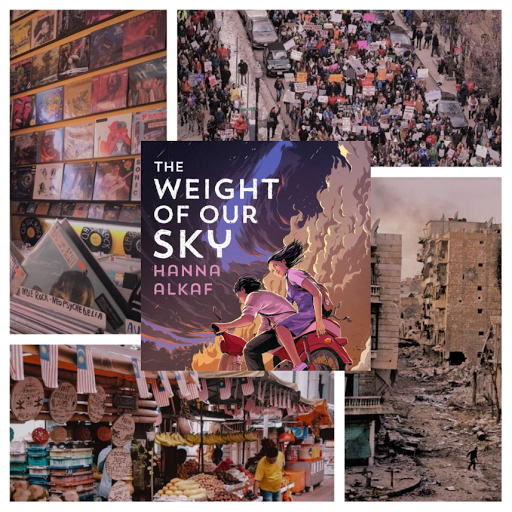 The Weight of Our Sky tells the story of Melati, a Muslim Malay girl living in Malaysia during the time of the 1969 race riots in Malaysia, an ugly battle between the Malays and the Chinese. Melati lives with OCD and anxiety, but she is led to believe that it’s instead a djinn that lives inside her head, feeding her images of her loved ones’ deaths that she believes she can only prevent by counting in threes. These race riots… are brutal. (Content warnings at the bottom of my review!) I’d never read anything about them before, and that just made it even more shocking. It’s hard to get through, because it hits you hard and you can’t believe that something so vicious could happen. And Alkaf doesn’t shy away from depicting these cruel acts against humanity and is able to depict both the horrors people faced and the hope people still had. Living through this is made worse for by Melati because of her mental illnesses. The portrayal of her anxiety and OCD is just exceptionally well-done, especially in a time and place where mental illness was heavily stigmatized. As someone with anxiety, the way Melati felt consumed by her fear and worry stood out to me, because the same thing often happens to me as well. When there is so much broken about the world we currently live in, one cracked person is easy enough to excuse or ignore. The Weight of Our Sky is immersive and engaging. Before I read this book, I was slumping, and especially struggling to read ebooks. This book, though, I absolutely devoured, reading so much faster than I usually do because it was just so engrossing. It packs so much into a book of less than 300 pages, without it feeling dry or slow, managing to keep you captured the entire time. One of the things that keeps you so captivated is Melati herself. Her character is written so well, and her struggle to manage her anxiety without giving into the Djinn is heartbreaking to read. You can feel her pain and her worry so much, and it’s enough to make you want to sob. But the way Mel is able to grow throughout the book and become stronger for the pain and troubles she goes through to find her mother is absolutely beautiful. Melati’s resilience is powerful and inspiring, and her love for her mother truly shines. Speaking of her mother—the relationships in this book were so strong. Melati refuses to stop searching for her mother, even when her own safety and health is at risk, and it seems hopeless at times. There’s Melati’s best friend Safiyah, who were in scenes I teared up over. There’s the Chinese boy Melati meets who helps her stay alive, Vincent, sweet and kind. There’s a little Malaysian girl Melati meets and takes care of, May. All of these relationships and more show how not only in this terrible time is there war and cruelty—there are also people helping people, Malay, Indian, Chinese. Race is what divided some, but race doesn’t keep apart everyone else from helping each other in their time of need. Alkaf’s gorgeous prose tops all of this off. Her nuanced portrayal of these horrific events is already impressive, but she also manages to write everything beautifully. How she can tell a story grim and dark but weave in threads of hope and light is beyond me. As a Southeast Asian, this book means the world to me. Southeast Asian rep is difficult to find in popular books, even in just “somewhat” popular books. And while I’m Thai, not Malaysian, there were so many cultural things in this book that I could relate to, even as someone who lives in the US and has visited Thailand only 6 times before. When I read of the streets described in the book, I pictured roads in Thailand. When I read of the markets and vendors in the book, I pictured the stands and street markets in Thailand. I mean, even the inclusion of motorcycles made me think of Thailand. It’s these little details that may not be noticeable to non-Asians that mean a lot to Asian readers. Just as it is obvious that I love Thailand and cherish my Thai culture, I see the same in Melati as well. Despite the horrors going on, it is clear that she loves her country still and is proud to be Malaysian. And that pride, that love—it is so very meaningful to see. This story is not only of heartbreak, nor is it a story only of hope. It is a story of both, and how you can be broken over and over again, but you will still survive and keep surviving, even if you have a few scars. I fully recommend this breathtaking historical debut. It’s incredibly difficult to get through without wanting to curl into a ball and wish nothing like this ever happened, but it is completely worth it. 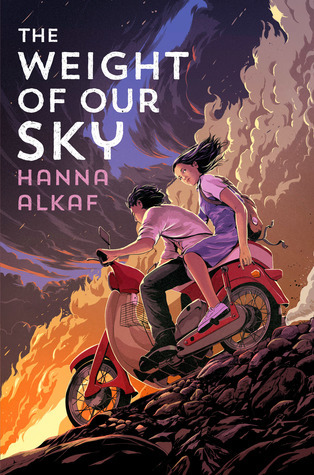 It’s an important, relevant story, and I have no doubt many others will fall in love with Melati, her journey, and Alkaf’s writing just as I did. There is a lovely INTERNATIONAL giveaway going on right now for a copy of this book plus a Kampung House Coloring Book! (You DEFINITELY don’t want to miss out on your chance to get this masterpiece.) Check it out through this link or by clicking on the logo below! are you planning on reading this book? have you entered the giveaway for it?! what historical fiction books have you read? are there any heartwrenching historical books you can recommend me?? Previous May’s Moments of the Month: January // Worst Book Slump Yet, All Over the Place Mental Health, but Lots of Self-Care!! I know I will, if your review is any indication! And I love your writing – it’s so eloquent and impactful, but still fun to read! I love all your posts! Oh my goodness, what a gorgeous, gorgeous review, May! Your love for the book is just so palpable, thank you for sharing. ❤ Added to my TBR and entered the giveaway! Aahh, Kathy, thank you so so much!! So happy you liked my review ❤ Good luck with the giveaway! This book sounds so good! It’s been on my radar for a while, but this post made me even more excited for it! Aahh thank you so much, Erica Mae!! Glad I could give you more reasons to check it out ☺ And yesss I usually am not a fan of historical fic because of its slowness but this didn’t feel slow at all to me! Ohh, really sounds like a great read! Will keep an eye out on this one at the local book stores! ahh this was so pretty and the book sounds amazing!!! This was an AMAZING review, May. I’d seen the cover of this floating around the blogosphere but didn’t know much about the story. You’ve 100% convinced me I need to pick it up! The OCD rep sounds so good and the Djinn element interesting! I don’t know anything about the history that this book covers so I’d be very keen to learn more from this book. AAHH BECKY!!! You are so sweet to me thank you 😭💕 So glad I could convince you to check it out! And yes, the mental illness rep was so fantastically well done and written and the historical event was so interesting (and heartbreaking) to read about! may, this was such a beautiful and heartfelt review that i loved with every fibre of my being! seriously … amazing!! i’m so happy that you got to be a part of this tour, and i’m glad you enjoyed the book! MAY!!! thank you for being part of the tour and i’m so so glad you enjoyed reading!!! thank you thank you thank you, lovely!